General Hospital (GH) spoilers tease that those closest to Oscar (Garren Stitt) may be in for a big surprise. Kim (Tamara Braun) has known for a while now that Oscar has a malignant and inoperable brain tumor. And she’s made it her mission to keep the truth from Oscar so that he can live the normal life of a teenaged kid and not worry about dying. It’s a deception that’s motivated by love on Kim’s part. She truly believes it is best for Oscar if he doesn’t know the truth. But what if Oscar already knows the truth? There are some reasons to suspect that Oscar’s already in the loop about his diagnosis and prognosis. First off, Oscar’s a smart and pretty perceptive kid. It’s hard to imagine that Kim’s had Oscar evaluated by numerous medical specialists and none of them ever uttered a peep about what was wrong with him. Certainly, Oscar would have overheard something from someone along the way that would have tipped him off. Sure, Oscar has explained his problem as being “low blood sugar” to Josslyn (Eden McCoy) and others, but he could simply be playing along with the story Kim told him about being hypoglycemic. What if Oscar found out the truth about his condition but decided to play along with Kim’s ruse? He might think that it makes things easier for his mom if he plays along, and he might not want people to treat him like he’s dying. 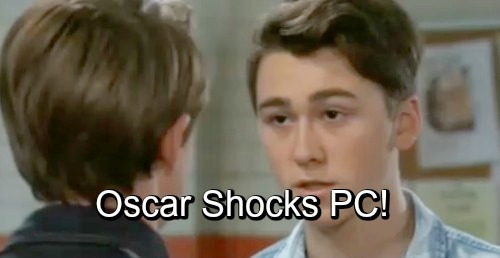 Then there’s Oscar’s reaction to Cameron’s (William Lipton) big reveal that “you have cancer.” Oscar didn’t seem that surprised to hear Cameron’s words, and on the new GH episode to air on Monday, September 24, Oscar will beg Cameron not to tell Josslyn about his condition. This certainly doesn’t sound like someone who is surprised to hear that he has cancer. Whether Oscar has really known all along about his condition remains to be seen. But it sure sounds like he might have known. If it’s true, then imagine how surprised Kim will be to learn that Oscar knew what she was trying so hard to keep from him. Do you think that Oscar knew about his condition before Cameron spilled the beans? Stay tuned to the ABC soap and don’t forget to check CDL often for the latest General Hospital spoilers, updates, and news. General Hospital Spoilers: Bombshell Shocker – Anna’s ‘Daughter’ Hiding in Plain Sight – Peter Was Born Female? General Hospital Spoilers: Billy Miller Stars In New Thriller Drama Series – What About His GH Future?